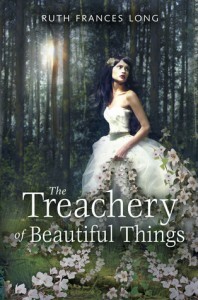 I have owned a copy of The Treachery of Beautiful Things by Ruth Frances Long for a while, however it has lanquished on my To be read pile since i got it at the Book Launch. When i managed to get a bit of momentum into reading recently, I took this off of my To be read pile and dived right in. The story opens with the disappearance of our heroines brother. He is kidnapped by the trees, she is the only witness to this crime..
Then years later, after years of wondering where he was, and therapy for what she had seen, she hears a pipe player, who sounds so much like her brother, that she must investigate. So begins a fun adventure in a land of fairytale. The land the other side of the edge seems like our own, but in truth is a place filled with magic, where you cannot trust anyone to be what you see. It is a place where the politics of who you follow and who you can trust are not at all obvious. The story is steeped in English fairytale legends, however I don’t think you need to be familiar with the source material. The characters are all introduced, and no real reference is made to their legend, except that which is explained in the story. While knowledge of Oberon, Titania, or Puck might add depth to the story it is not necessary in order to enjoy it. I really suggest you go out and read this book. It is unlikely to disappoint you. Though you may never look at the trees around you the same ever again!